Feeding birds in your yard can be rewarding , but it can also be frustrating if you don’t know how to squirrel-proof a bird feeder to avoid losing seed to furry diners. From buying specialized feeders to easy, quick tricks, it is possible to keep squirrels from taking advantage of your buffet without birds going hungry. The best types of birdseed, including black oil sunflower seeds, nuts, and suet, are just as attractive to squirrels as they are to birds. At first, it may seem like a squirrel is a welcome addition to backyard wildlife, and many birders don't mind occasional squirrel visits. Other birders, however, may have more difficulties with squirrels and their voracious appetites, frequent visits, and domineering attitudes. Unlike birds that will usually share feeders with other visitors, squirrels tend to scare or chase away birds and may stay at the same feeder until it is empty, consuming seeds quickly without any birds getting a bite. As they try to get to delicious birdseed, squirrels will chew and claw through both wooden and plastic feeders, possibly damaging them so they can no longer be used. Squirrels can also be predators and have been known to eat eggs and kill nestlings, which makes a squirrel-friendly yard less attractive to nesting birds. There are many ways to make a bird feeder less accessible to squirrels without restricting its appeal to birds. For the best results, try several methods to squirrel-proof a bird feeder to deter even the savviest squirrels. Location: Squirrels can jump distances of 10 feet or greater, so place feeders well away from trees, wires, porches, gutters, roofs, and other launching points to make it harder for squirrels to get on the feeder. Ideally, mount or hang feeders on a smooth metal pole at least six feet high, and prune back any branches or bushes within a 12-foot radius. Cages: Place a wire cage around a bird feeder. Squirrels will not fit through small wire openings but that will not restrict smaller birds from feeding. This is also useful for preventing larger bully birds, such as starlings, grackles, and pigeons, from accessing the feeder. Some feeders come equipped with cages, or you can easily add mesh to an existing feeder. A larger cage can be placed around a feeding station with several feeders inside the barrier. Baffles: Add smooth plastic or metal baffles above and below bird feeders. The baffles should be at least 15-18 inches wide or long to prevent squirrels from reaching around them. 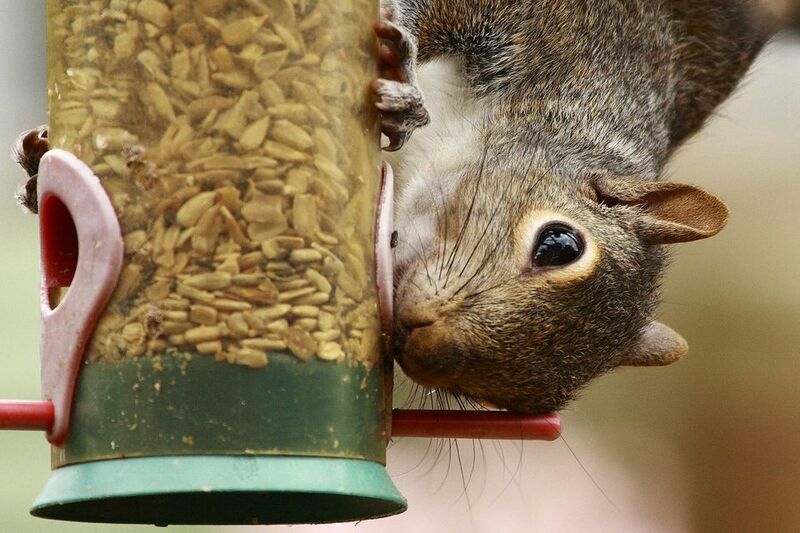 Many squirrel baffles are designed to twirl or tilt if a squirrel climbs onto them, keeping the animal off balance and unable to access the feeder. Cleanliness: Keep the area around the feeder clean and remove debris and spilled seed from the ground that could be attracting squirrels. This also ensures that ground-feeding birds do not eat old, contaminated, or rotting seed that could be unhealthy. Spinners: Hang a feeder from a thin horizontal wire strung with spinners to keep squirrels from climbing across the wire. Spinners may be a line of thread spools, short lengths of pipe or hose, or empty plastic bottles strung along the wire that will spin and keep squirrels from accessing the feeder. When squirrels try to cross the spinners, they are tipped over and fall away from the feeder. Feeder Style: If you need to replace feeders that squirrels have already destroyed, opt for specially designed feeders with doors or hatches that will be triggered to close by a squirrel’s weight. This will restrict squirrels' access to seed, but lighter birds will not trigger the hatches and can still feed freely. Alternatively, choose metal feeders or designs with thick, sturdy materials that squirrels will be less able to damage. Seed: While squirrels will readily sample most types of birdseed, they are less attracted to nyjer and safflower seed, both of which have a bitter taste. By using these seeds exclusively, you close the squirrel snack bar without eliminating feeding the birds. Spicy Seed: Mammals, including squirrels, are sensitive to the perceived heat of pepper, but birds are not. Adding cayenne pepper or similar spices to birdseed can deter squirrels, but it can wash off and must be used consistently for the best effects. When handling pepper, wear gloves and avoid breathing in the dust. Some retailers have pre-treated seed and suet available with even hotter pepper components. Traps: If squirrels are a strong nuisance at your backyard feeders, contact local wildlife authorities about the possibility of using humane traps to remove squirrels from the area. Local regulations on trapping and releasing squirrels will vary, and you should follow all wildlife laws meticulously. Remove Shelter: Be sure squirrels don't make a convenient home nearby by removing possible shelter locations. Take steps to keep squirrels from nesting in old sheds, under eaves, or in attics. The further away a squirrel's home is from your feeders, the less likely they will be to visit. While it can be frustrating to try several squirrel-proofing methods only to see seed continually disappear, there are certain techniques that should never be used to control squirrels. Hunting: Shooting squirrels is illegal in many areas and it is too likely to also injure birds when aiming for squirrels. Even using different weapons such as slingshots, BB guns, or dart guns is not suitable. Poison: Poisoning seed or setting poisoned bait for squirrels can result in dead birds that sample the bait. Other wildlife may also be adversely affected by improperly used poisons, including raptors that may prey on poisoned squirrels. Cats: Do not release a cat to hunt squirrels, as the cats are just as much a threat to backyard birds as they are to other feeder guests. Cats will not discriminate about which prey they choose. Grease: Adding grease or oil to a pole or hanger to make it too slippery for squirrels to climb is not only largely ineffective, but it can coat the animals’ fur as well as birds’ feathers. This can cause illness and vulnerability to predators just as much as an oil spill or any similar contamination. Glue Traps: Often suggested to eliminate rodents, these traps are dangerous and inhumane, and often trap birds as well. Many squirrels are too large for glue traps to be effective, and instead these traps will cause vicious injuries without eliminating a squirrel problem. Even when using several techniques, it isn’t always possible to completely squirrel-proof a bird feeder. If the squirrels refuse to leave, stopping all feeding for several days or weeks may encourage squirrels to move on to other food sources. It is equally likely, however, that the squirrels will return as soon as new feeders are in place. Some birders, instead of eliminating squirrels, compromise by creating a squirrel feeding station away from the bird feeders. Easier to access feeders with tempting treats such as nuts, corn, and berries may attract squirrels’ attention and let the birds enjoy eating without competition. This also lets nature enthusiasts enjoy the intelligence and antics of squirrels without the frustration of seeing expensive birdseed eaten so quickly. In the end, squirrels are just as much a part of backyard wildlife as cardinals, jays, and finches. While it is possible to squirrel-proof a bird feeder and deter furry visitors from frequent meals, an occasional squirrel visit is to be expected at any bird feeder. Add an Edible String Bird Feeder to Your Trees - Easy Feeding!